Whether you are a Locks Heath Landlord looking to liquidate your buy to let investment or a homeowner looking to sell your home, finding a buyer and selling your property can take an annoyingly long time. It is a step-by-step process that can take months and months. In fact, one of the worst parts of the house selling process is the not knowing how long you might be stuck at each step. 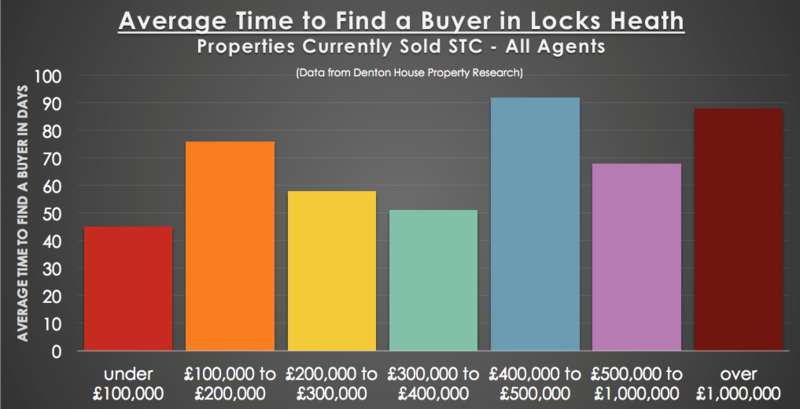 At the moment, looking at every estate agent in Locks Heath, independent research shows it is taking on average 62 days from the property coming on the market for it to be sold subject to contract. But trust me… that is just the start of a long journey on the house selling/buying process. The journey is a long one and therefore, in this article, I want to take you through the standard itinerary for each step of the house selling procedure in Locks Heath. You need to instruct an estate agent (of course we can help you with that) who will talk through a marketing strategy and pricing strategy to enable you to find a buyer that fits your circumstances. 62 days might be the average in Locks Heath, yet as I have said many times, the Locks Heath property market is like a fly’s eye, split up into lots of little micro markets. Looking at that independent research, (which only focused on Locks Heath – or rather SO31 to be precise), it was interesting to see how the different price bands (i.e. different micro markets) are currently performing, when it comes down to the average number of days it takes to find a buyer for a property in Locks Heath. 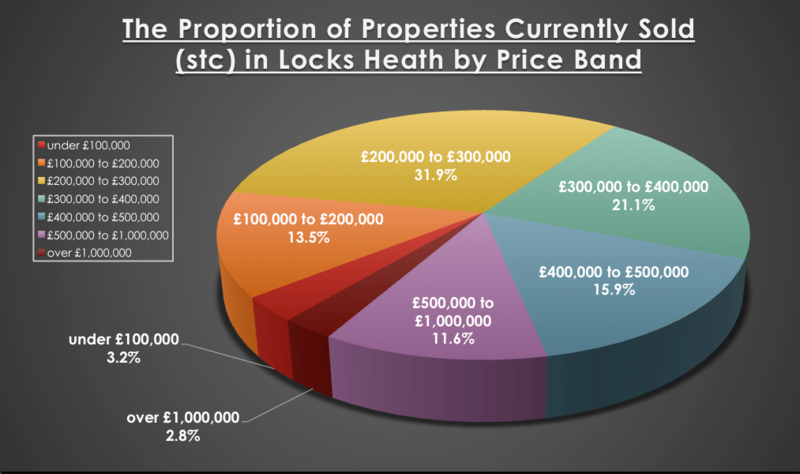 Interestingly, I thought I would see which price band had the highest proportion of properties sold (stc). Again – fascinating! So, now you have a buyer… what next? There are a variety of distinctive issues at play when selling your property in Locks Heath, together with the involvement of a wide and varied range of professionals who get involved in that process. That means there are enormous differences in how long it takes from one property to another. Moving forward to the next steps, these are the average lengths of time it takes for each step to give you some idea of what to expect. Once you buyer’s solicitor receives the paperwork from your solicitor, then your buyer’s solicitor applies for local searches from the local authority (to ensure no motorways etc., are going to be built in the back garden!). These searches can take a number of weeks to be returned to the buyer’s solicitors from the council, from which questions will be raised by the buyer’s solicitor to your solicitor (trust me – you don’t see a tenth of the work that goes on behind closed doors to get the sale through to completion). Meanwhile, the surveyor will check the property to ensure it is worth the money and structurally sound. Overall, this step can take between 3 and 6 weeks (sometimes more!). Assuming all the mortgage, survey and legal work comes back ok, both the buyer and solicitor sign contracts, the solicitors then perform “Exchange of Contracts”. When contracts are exchanged, this is the first time both buyer and seller are tied in. Before then, they can walk away… and you are probably 4 or 5 months down the line from having put up the ‘For Sale’ board – this isn’t a quick process! BUT hold on… we aren’t there yet! Between a week and up to six weeks after exchange of contracts, the buyer’s solicitor sends the purchase money to the seller’s solicitor, and once that arrives, the keys will be given to the buyer. Phew! If you are thinking of selling your Locks Heath home or if you are a Locks Heath Landlord hoping to sell your buy to let property (with tenants in), either way, if you want a chat to ensure you get a decent price with minimal fuss… drop us a message or pick up the phone.